Located on Thassos Island, the Golden Beach holiday resort has a magnificent white-sand beach, and offers easy access to Potomia and Panagia. The quaint villages provide most things holidaymakers might need. Compared to many Greek resorts, Golden Beach has a subdued nightlife. Most visitors enjoy themselves by hiring a car and exploring the island, enjoying the beach, or trying out the many seafront tavernas. All in all, Golden Beach is a pretty, peaceful and charming. Shopping opportunities in Golden Beach are limited to a few kiosks and small supermarkets. They're likely to fall short of seasoned shoppers' expectations, though they're enough to keep self-caterers happy. Waterfront kiosks sell beach accessories like airbeds, along with ice cream, magazines and cigarettes. For serious souvenir shopping, visitors can take a trip to the island's capital, Limenas, which is just a short taxi drive away. The town's little shops sell everything from lighters engraved with an island scene to magnificent marble sculptures. Island specialities include fragrant honey, locally made olive oil, and marble. 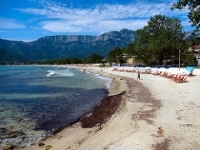 Golden Beach has many tavernas. Menus and quality vary, but most offer authentic Greek food, with the emphasis on seafood and ambience. Prices range from inexpensive to cheap, making eating out in Golden Beach all the more pleasant. Nightlife is limited to a few cocktail bars and local tavernas, where visitors may find some live Greek music and dancing. Thassos Town is nearby and has some clubs and piano bars, though nothing to rival establishments at the more crowded and fashionable resorts. Golden Beach and the other main tourist beaches on Thassos offer a variety of watersports, with a range of equipment available for hire. Most visitors spend a day or two sightseeing on the scenic island, which has several interesting archaeological sites. Visitors can hire cars or motorbikes and find these places on their own time. Hiking and horse riding are also popular activities. Visitors can source guidebooks from most kiosks. During late summer wasps can be a problem and a nuisance to visitors in Golden Beach. Some shops and tavernas do not accept credit cards.